This 6" basket quilt block pattern is easy to sew and the block's variable handle makes it a cinch to choose a method that suits your needs and quiltmaking skill level. Baskets in the photo are sewn with contrasting fabrics in reversed positions. Some were made with light black on white baskets and a dark or bright background, while others were sewn in the reverse layout. 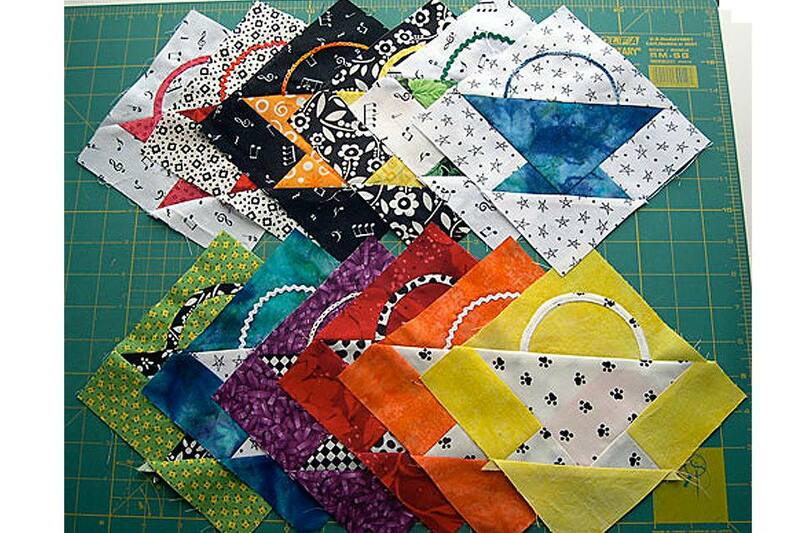 The basket block is perfect for scrap quilts but a themed quilt suits the design just as well. Use the pattern to make quilts of any scale, from baby quilts to bed quilts. Choose the same types of fabrics or change the color layouts. Use a quarter inch seam allowance throughout. Save the extra triangles for another quilt block. Sew a small basket base triangle to the end of each background rectangle, creating mirror image pairs (step 1). Press to set the seams (always when possible). Clip the little triangles that stick out at one end of the seam. Sew a rectangle/triangle unit to each side of the basket base triangle cut by dividing a 5-3/8" square. Leave little 'dog leg' triangles in place. Center and sew the bottom background triangle, created by dividing the 3-7/8" square, to the bottom of the block. Press the seam allowance towards the bottom triangle. Do not sew the top triangle to the basket yet. Cut a handle from the same fabric as the basket and appliqué to the background. No matter which basket handle method you choose, begin by determining its position on the large background triangle. Make a paper template that's a 3-1/2" circle. Mark the midpoint across the circle, and then cut all the way across 1/4" below the mark. Center the circle on your unsewn large background triangle as shown. Trace around the circle to mark the position of your handle. Cut a 1" x 7" strip (adjust the length if too long). Strips cut on the fabric's bias have some stretch and will allow you to curve the handle with ease. Fold in half, wrong sides together and stitch about a 1/4" seam. Trim the seam a bit. Press, rolling the seam to place it midway between the pressed edges. A bias press bar makes this step easier, but you can open the tube for easy pressing by inserting a bamboo skewer or other similar object. Remove before pressing. Placing the seam down, hand or machine appliqué the strip to the triangle, taking care not to stretch the triangle in the process. To make a rickrack handle, match a length of rickrack to the marked handle lines and sew to the triangle (see page 5 for an illustration). Be sure to extend the ends of a rickrack handle beyond the seam allowance. When basket halves are joined, the seam will stabilize the rickrack ends and keep them from fraying. Center and sew the handle triangle to the basket bottom. Press. The basket block should measure 6-1/2" square. Insert the finished block into an embroidery hoop if you are creating an embroidered handle. Rickrack is sewn to the large background triangle.